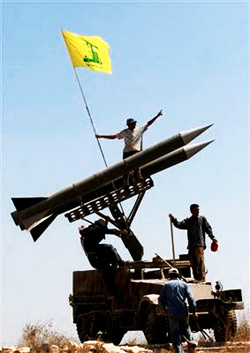 Hizballah has 40,000 rockets and missiles, compared to 3,000 in 2006, capable of striking all of Israel. Group also believed to have received more surface-to-surface rockets, some of which can reach targets 300 km. away; Hezbollah took advantage of Syria crisis to obtain weapons. The IDF has changed its operational assessment regarding the threat from Lebanon and is currently working under the assumption that Hezbollah has obtained sophisticated long-range surface-to-air missile systems from Syria, The Jerusalem Post has learned. According to Western intelligence assessments, Hezbollah is believed to have taken advantage of the ongoing upheaval in Syria to obtain advanced weapons systems, such as additional long-range rockets as well as Russian-made air-defense systems. While Hezbollah is known to have a large quantity of shoulder- launched anti-aircraft missiles, the IDF now assumes that the Lebanese Islamist group has received the SA-8, a truck-mounted Russian tactical surface- to-air missile system reported to have a range of 30 kilometers. In addition to the possible transfer of air-defense systems, Hezbollah is also believed to have received several dozen more M600 long-range missiles, as well as additional 302 mm. Khaibar-1 rockets, which have a range of about 100 kilometers. It is already believed to have a significant arsenal of M600s, which are manufactured in Syria as a clone of Iran’s Fateh- 110. The M600 has a range of around 300 kilometers. It can carry a half-ton warhead and has superior accuracy. Syria recently deployed some of the more sophisticated air-defense systems it has received over the past year from Russia, including the SA-17, an even more advanced system than the SA-8, with longer ranges and greater accuracy. A number of batteries are believed to have recently been declared operational in Syria, which has spent close to $2 billion on air-defense systems in recent years. As reported two weeks ago in the Post, Israel is particularly concerned with the possibility that Syria’s arsenal of chemical weapons will fall into terrorist hands, amid predictions that President Bashar Assad’s regime will fall in the coming months. This has not yet happened, though, and Syrian chemical warfare facilities are understood to still be under the control of Assad’s regime.